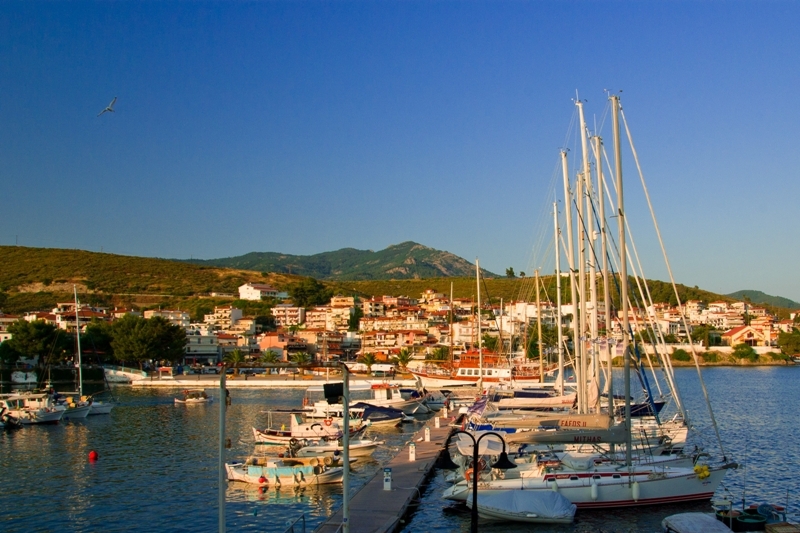 Neos Marmaras is one of the most cosmopolitan villages in Sithonia which combines relaxation and entertainment for all ages. That’s town founded in 1922 by refugees from the island of Marmara in Asia Minor. Local tradition is symbolized by the boat called “Santala” which used as fishing fleet. Neos Marmaras is now the most cosmopolitan in Sithonia; It provides all kind of accommodation, camping sites, bars, cafes, tavernas, wine shops, folk art shops, health center, etc. The replica of the boat “Santala” which stands in the town’s harbor. The “Tripotamos metochi” of 19th century, a building complex of Kastamonitou Monastery and the “metochi” of the Monastery Gregoriou built in 1865. The Kelifos island, just two miles from the coast, is a steep, rocky waterless island covered with pine-trees and wild olive trees. Porto Carras Grand Resort is a unique tourist complex including 4 hotels, a private marina, a casino, a conference center, a thalassotherapy & spa center. It also, provides golf courses, horse riding, tennis, football, volleyball, basketball facilities and a wide coast of crystal, sandy beaches. Visit the winery in Porto Carras and taste fine local branded wines.